Appalachian Sustainable Agriculture Project, www.asapconnections.org – local food and farms advocates promoting regional Farm Guide and Farm Tours; classroom projects; listserv. Asheville Permaculture Guild, www.ashevillepermacultureguild.org presently low-activity with occasional posts. Bountiful Cities, www.bountifulcities.org – Asheville’s nine city wide community gardens, including Dr. George Washington Carver Edible Park with over 40 different fruit and nut trees. Carolina Farm Stewardship Association, www.carolinafarmstewards.org – over 30 yrs. old non-profit Carolina Farm Stewardship Association promotes organic agriculture in both North and South Carolina. Earthaven, www.earthaven.org – Developing Permaculture ecovillage and training site near Asheville/Black Mountain, NC. Numerous Pc classes and workshops. Intern opportunities. Heartwood, www.heartwood.org – Heartwood stretches over the eastern hardwood region of the US and balances forest protection, energy concerns, and support for sustainable projects-including permaculture. 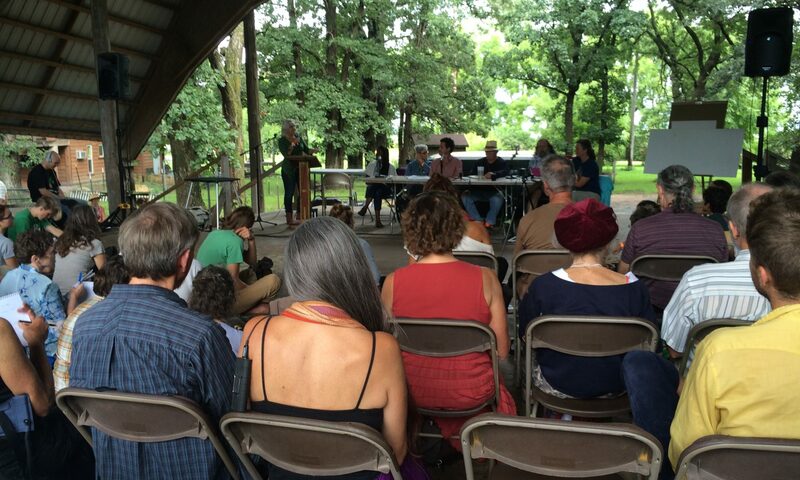 Heartwood hosts a Forest Council each Memorial Day and a Reunion for activists each year in October. Sustainable Western NC, www.sustainablewnc.org – gateway to Asheville and Western NC – food/ shelter/ community/ Energy/ Economy/ Environment. Open listserv primarily for The Summer Gathering at Celo community near Asheville. www.fireflygathering.org offers over 100 Primative Technology/Earth Skills, hands-on workshops with highly experienced presenters on a wide range survival skills from fire building to brain tanning near Asheville. Organic Grower’s School, Asheville, NC area, www.organicgrowersschool.org is the largest SE three-day organic conference with over 16 tracks (including permaculture), 70 speakers, half-day and full-day workshops. North American Permaculture Convergence, www.northamericanpermaculture.org. 2014, Minnesota; 2016, California. Permaculture Institute of North America, www.pina.in, offers diplomas in applied permaculture fields including education and site design. Candidates work with Field Advisors to complete their diploma work and present them to regional experts. Southeast Wise Women, Asheville, NC area: http://SEWiseWomen.com, hosts incredible gatherings with both spring Herbal Immersion and Fall Conference with over 60 classes (2016) and over 1,000 women attendees. Great Rivers and Lakes Permaculture Institute, www.greatriversandlakes.org. A regional organization for the states of Kentucky, Ohio, Indiana, Illinois, Michigan, and Wisconsin. www.livingsystemsdesign.net – new permaculture services group with Chuck Marsh, Zev Friedman and friends. Offers consulting and installation services. Useful Plant Nursery, www.usefulplants.org – Permaculture long-termer Chuck Marsh’s and associates nursery of over 200 edible and useful plants. Mountain Gardens Herbs, mountaingardensherbs.com – Joe Hollis’s 25 year-old evolving “Paradise Garden” with best collection of medicinal herbs (over 500 species) in Southeast. Sells plants, seeds, tinctures, dried herbs. Has workshops/interns. Patchwork Urban Farms, Asheville NC: http://patchworkurbanfarms.com unique urban farm(s) using an assortment of donated small parcels scattered around town to support land donors with food-trade, offers CSA, and is active at local tailgate market. Permaculture in Action, Asheville, NC area: http://permacultureinaction.com. develops model Pc demonstration sites where landowners host PC demonstration projects by partially paying teachers who also charge students. School of Integrated Living, Asheville NC area: http://schoolofintegratedliving.org – Earthaven collaborative group, PC Teaching and demonstration. Living Web Farms, Mills River, NC: http://livingwebfarms.org – extensive workshops, archived workshop videos, and demonstration site. Wild Abundance, Barnardsville, NC: http://wildabundance.org – Primitive technology skills and permaculture classes, networking, and demonstration sites.